The watch covers the area from Grand Isle, Louisiana, to west of Destin, Florida. The center of the storm is forecast to be near the coast within that area Saturday. "Karen is expected to be at or near hurricane strength late Friday and early Saturday," read a hurricane center advisory. The storm, which as of Thursday evening was about 360 miles south of the Mississippi River's mouth, prompted the Federal Emergency Management Agency to recall some of its workers, furloughed during the government shutdown. The agency also reactivated its Hurricane Liaison Team at the National Hurricane Center in Miami. FEMA officials in the Atlanta and Denton, Texas, offices are monitoring Karen. "At all times, FEMA maintains commodities, including millions of liters of water, millions of meals and hundreds of thousands of blankets, strategically located at distribution centers throughout the United States, including in the Gulf Coast region, that are available to state and local partners if needed and requested," the agency said in a statement. The hurricane center said it, too, would be unaffected by the government shutdown as Karen approaches. "The National Hurricane Center is fully operational ... and has all of its resources available to it," spokesman Dennis Feltgen said in an e-mail. "The government shutdown will not inhibit NHC from providing its mission." A tropical storm watch was in effect from west of Grand Isle to east of Morgan City, Louisiana, an area that includes metropolitan New Orleans, Lake Maurepas and Lake Ponchartrain. A tropical storm watch was also in effect from Destin to Indian Pass, Florida. Louisiana Gov. Bobby Jindal declared a statewide state of emergency. Florida Gov. Rick Scott declared a state of emergency in 18 counties. New Orleans officials released a statement asking residents to "monitor weather conditions and stay alert." Karen formed between Cuba and Mexico's Yucatan Peninsula. It's producing winds of 65 mph, with higher gusts. The storm is moving north-northwest up the Mexican coast at 12 mph, the hurricane center said. 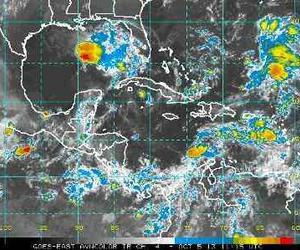 "Karen is expected to produce heavy rainfall over portions of western Cuba and the northeastern Yucatan Peninsula during the next day or so," according to the center's advisory. In the central Atlantic Ocean, Tropical Depression Jerry became a remnant low. It had sustained winds of 35 mph as it moved east-northeast at 14 mph. It poses no threat to land.